Big on features, not on price. Manage daily tasks with the affordable Inspiron™ 15 — a 39.6 cm (15.6") laptop with available 3rd Gen Intel® Core™ processors, a thin design and 10-key number pad. Starting at about 2.54 cm (1") thin, the Inspiron 15 is sleek and portable. And, its quilted lid and palmrest design makes it as stylish as it is mobile. Never be without your digital entertainment. 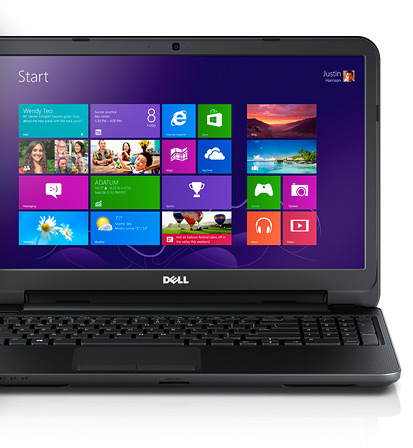 The Inspiron 15 is equipped with a DVD-RW drive and a spacious hard drive to store your music, movies and pictures. Complete your to-do list faster and more efficiently with 3rd Generation Intel processors and Windows 8. The Inspiron 15 features an 8-in-1 memory card reader, USB 3.0 and HDMI® 1.4 ports.